Free Download Meow Meow Star Acres Apk For Android From RevDl . SUMMER CAMPAIGN IN PROGRESS! Start a new game during the campaign period (8/5～8/19[EDT]) and get a gift of 30 free Rubies! Spend your summer building an exciting island with the cats! An educational game that both adults and children can enjoy from Kuma the Bear. 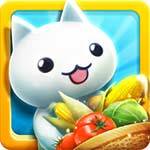 Let’s explore Star Island and help the cats cultivate the fields and raise farm animals! You can use your crops to make butter, bake a cake, and learn all kinds of recipes. Share the food you make with your feline friends, and they’ll give you coins and stars (experience points)! You can buy new tools and decorations with your coins… make this island unique! The cats on Star Island can’t wait to spend time with you! Not only adults, but small children can play as well! Gathering all your crops with one drag of the finger is effortless! They cultivate the fields, cook, skip work, and sometimes get angry… just try to resist their cute mannerisms! Baking cakes, squeezing juice, making cheese… every time you level up, the cats learn a new recipe! Till the fields, raise chickens and cows, and make the island beautiful! This warm, laid-back paradise is waiting for you! Recover game data by advance user registration. Super simple and stress-free! * Certain features requires a network connection. Kuma the Bear’s island simulation game Meow Meow Star Acres is free to download!